September 17, 2012 December 15, 2017 Sam1 Comment on Welcome to Eastside Portland Streetcar! Welcome to Eastside Portland Streetcar! This (unofficial) tour explores the route of Portland’s new Eastside Streetcar. 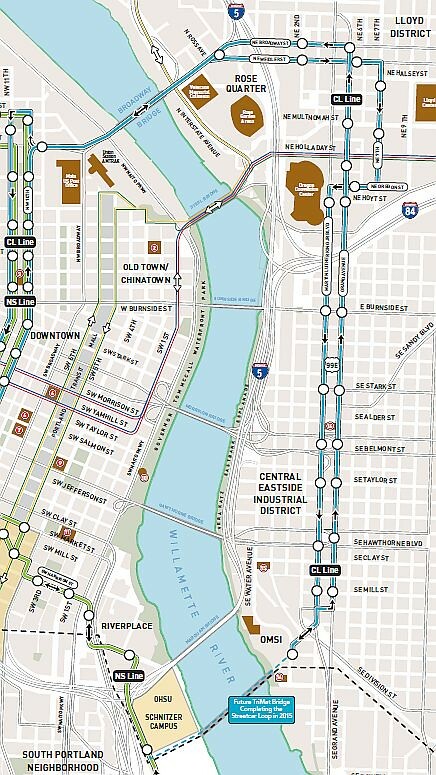 The new Central Loop (CL) will run from SW Market in downtown Portland, along 10th and 11th to the Pearl District, then across the Broadway Bridge to the Eastside. This website highlights interesting things along the route. A successful demonstration of electric trolleys in Richmond, Virginia, in the late 1880s soon gave rise to dozens of urban streetcar systems. Here are some streetscapes of Portland in 1918 by the Ford Motor Company. By 1918, half of US streetcar mileage was in bankruptcy due to the increased popularity of cars. By the 30s and 40s, cars and buses had taken their toll and most trolley lines were converted to bus lines. The Urban Mass Transportation Act of 1970 stimulated a resurgence by supporting transit with matching federal funds. 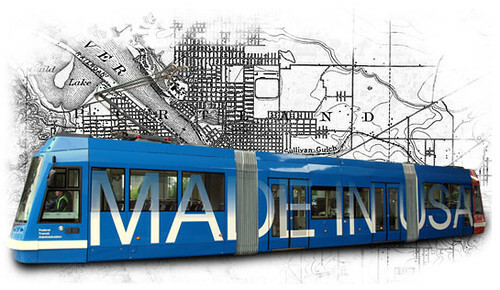 Portland became the first major city to invest in new streetcars, opening a new line on July 20, 2001. The initial 8 mile loop (4 miles in each direction) ran from Portland State University to Legacy Good Samaritan Hospital. A total of 46 stops were located about every 3-4 blocks. In August 2007, passenger service was extended to the South Waterfront District. The new 3.35-mile Streetcar Loop opens Sept 22, 2012. It opens a few months behind schedule because of manufacturing delays producing the only American-made modern streetcar. 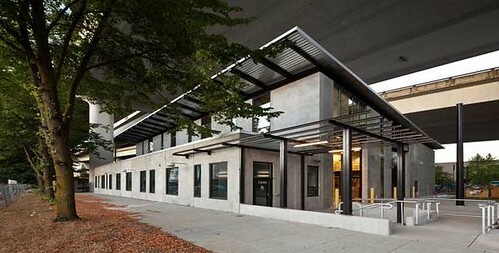 The new Eastside line goes from the Pearl District, across the Broadway Bridge, connects to Lloyd Center at NE 7th Avenue, then south along MLK Bvd through the Central Eastside Industrial District and terminates at OMSI. It returns via Grand Avenue. Beginning in December, five new streetcars will be delivered to serve the expansion. The system’s existing streetcars were made in Czechoslovakia, while the new ones are being made in Portland by United Streetcar, which is in a good position to serve a growing demand for streetcars throughout the United States. Officials cut one of the original six streetcars to bring it in on budget. The Loop Project cost about $148 million. The Eastside Extension is funded primary with money that cannot be spent on other projects. 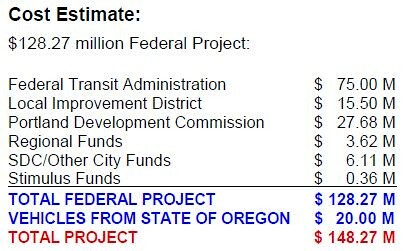 Funding (pdf) comes from the Federal Transit Administration ($75 million), Portland Development Commission ($27.7 million), and local improvement districts ($15.50 million), where property owners share in the cost of transportation infrastructure improvements. Metro chipped in $3.62 million and the Oregon State Lottery ($20 million) will pay for five streetcars manufactured by United Streetcar, a subsidiary of Oregon Iron Works in Clackamas. Colas Construction built the new Maintenance Facility, designed by Waterleaf Architects. It’s located under the Fremont bridge in the Northwest, between Lovejoy and Northrup. The building will service existing and new streetcars. The Eastside Streetcar Loop has 28 new stops. Later, as a separate project, the Loop will be completed via a new bridge at the south end, allowing continuous connections around the entire Loop. The grand opening and ribbon cutting celebration was September 22, 2012 with Portland Mayor Sam Adams, a strong supporter of the streetcar expansion officiating. He was joined by Rep. Earl Blumenauer, Rep. Suzanne Bonamici and dignitaries from the Federal Transit Administration, TriMet, Metro, Portland Streetcar Inc., Oregon Transportation Commission, OMSI and Portland State University. When all the cars are ready to go, streetcar frequency will be about every 18 minutes between 9:30am and 5pm. Streetcar Fare is $1.00, valid for 2 hours on the Streetcar only. This virtual tour was done just for fun as a private exercise. No money was spent creating it. It utilizes bar codes, called QR codes, that (hopefully) are temporarily located near every TriMet stop. If you snap a picture of the QR code with your phone, it should automatically take you to the page exploring that stop. Note: Below are two free Microsoft Word documents which you can download onto your phone, tablet or PC. You’ll need both files for the complete tour. The first one is for traveling to OMSI, the second file is for the return trip.